Eliminate regulatory remediation results - FDA 483s or Warning Letters - Achieve a compliant, effective & efficient Quality Management System - diagnose, develop, implement, validate and quantify critical business process effectiveness. Getting new product into market quickly and effectively is the key to success. Developing product consistent with FDA requirements while not slowing the R&D effort is a tricky business; if the system is designed properly, you can have both. Ever wonder why companies face recurring problems, missing deadlines & targets - costing time & money? Problems lead to recalls and potential regulatory actions...all avoidable. 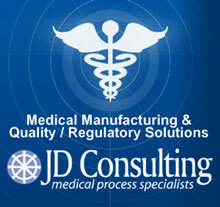 Cost-effective manufacturing results in exceptional service to your customers. Copyright © by JD Consulting. All Rights Reserved. Developed by HQZ Experts.